There are different types of headaches including migraine, tension and cluster headaches. The causes of headache are as variable as the proposed treatments. Over the last 5 to 10 years plastic surgery in the treatment of headaches has become increasingly popular. This blog only deals with eyelid surgery and tension headaches. Upper eyelid surgery can be cosmetic for the removal of excess skin or reconstructive to improve vision by removal of excess skin and/or eyelid ligament tightening . A cohort study of 108 eyelid skin removal only cosmetic blepharoplasty and 44 reconstructive skin removal with eyelid drooping blepharoptosis procedures (cosmetic and drooping eyelid surgery) treated between September 1, 2014 and September 1, 2015 were compared using Headache Impact Test-6 scores before and after surgery. The test scores are derived from questionnaires completed by patients. 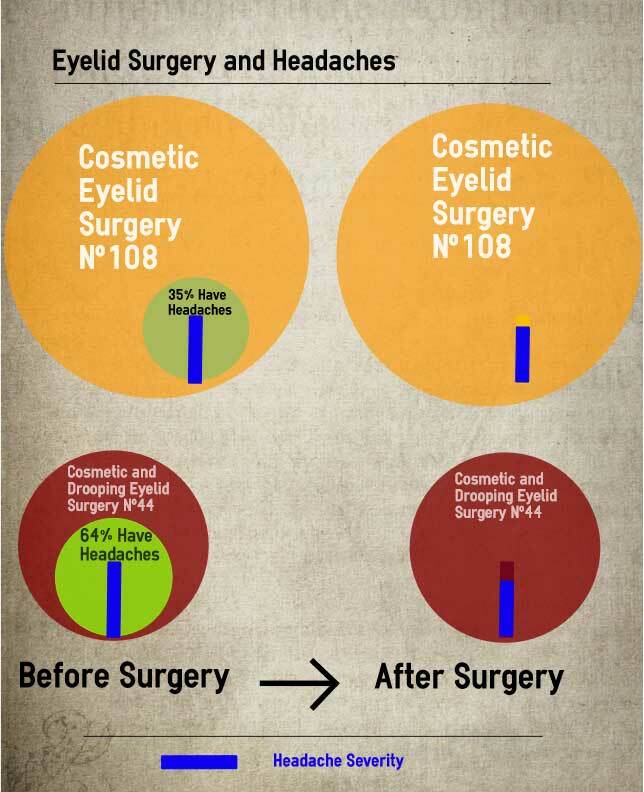 35% of the skin only blepharoplasty and 64% of the visually impaired patients had tension headaches before surgery. The scores in the first group went from 56 to 46 and in the second group from 60 to 42 following surgery. The conclusion is more patients with drooping eyelids affecting vision have headaches than patients who just want cosmetic upper eyelid surgery and though both groups have less severe headaches after surgery those whose vision was affected have more improvement. Additionally the more their vision was affected the greater headache severity they had before surgery and the more relief they had after surgery.